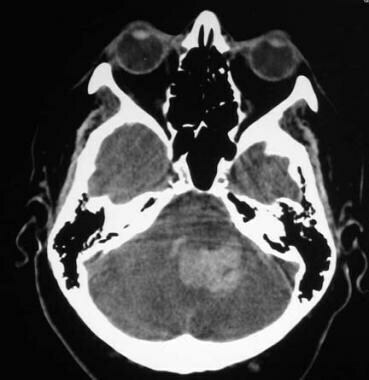 A CT scan of the head that demonstrates a left occipital arteriovenous malformation (AVM), with multiple calcified phleboliths and numerous hyperattenuating vascular channels. A sagittal T1-weighted MRI demonstrating a large occipital arteriovenous malformation (AVM) with parasagittal flow voids. A diffusion-weighted MRI showing a lack of signal intensity associated with an arteriovenous malformation (AVM). 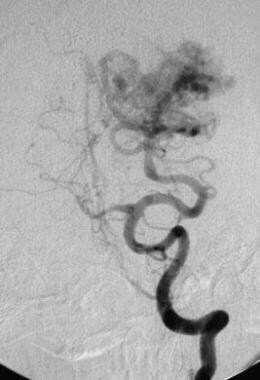 A lateral left carotid angiogram demonstrating a mixed pial-dural arteriovenous malformation (AVM). Arterial and occipital arterial feeders extend to the nidus via distal branches of the middle cerebral artery. Arteriovenous malformation (AVM) of the brain. A CT scan of the posterior fossa demonstrating a hemorrhage in the fourth ventricle, with extension to the left cerebellum. Arteriovenous malformations are categorized by their blood supply. Pial or parenchymal arteriovenous malformations are supplied by the internal carotid or vertebral circulation, whereas dural arteriovenous malformations are supplied by the external carotid circulation. Mixed arteriovenous malformations are supplied by both. Pial arteriovenous malformations, which are almost exclusively congenital, are the most common kind. Dural arteriovenous malformations are relatively uncommon and are theorized to be secondary to trauma, surgery, thrombosis of an adjacent venous sinus, or venoocclusive disease. Mixed arteriovenous malformations usually occur when the lesion is large enough to recruit blood vessels from both the internal and external carotid arteries. A pediatric variant of arteriovenous malformation is the vein of Galen aneurysm, in which an arteriovenous malformation drains to and dilates the great vein of Galen. Pial arteriovenous malformations tend to be asymptomatic until the second, third, or fourth decade of life. They most commonly manifest as spontaneous hemorrhage or seizure. Other clinical signs include headache and transient or progressive neurologic deficit. Dural arteriovenous malformations typically feature pulsatile tinnitus, cranial bruits, headaches, or hemifacial spasm. Infants with a vein of Galen malformation may present with hydrocephalus or severe congestive heart failure. The first imaging study that is performed in patients with a suspected AVM is usually a computed tomography (CT) or magnetic resonance imaging (MRI) scan. These studies are good for depicting AVMs and they are relatively noninvasive, only requiring an injection of contrast material into a small vein. Overall, arteriovenous malformations are best imaged by using MRI, which can uniquely show these lesions as a tangle of vascular channels that appear as flow voids. Nonenhanced CT is superior for visualizing the small foci of calcification often associated with arteriovenous malformations, and it may also delineate hyperattenuating serpiginous vessels the constitute the nidus. MRI can help identify and characterize AVMs of the CNS, including the brain and spinal cord, without the use of radiation or invasive techniques. MRI is the examination of choice in patients with chronic headaches, seizure disorders of unknown etiology, and pulsatile tinnitus (among other conditions). 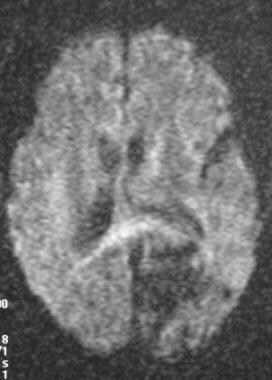 MRI typically follows CT scanning in the acute setting of neurologic illness when an underlying vascular lesion, such as an AVM, is suggested. MRI scans can demonstrate areas of parenchymal AVM involvement, showing both dilated feeding arteries and enlarged draining veins. Catheter angiography remains the criterion standard for characterization and delineation of brain and spinal AVMs. Angiography is a dynamic real-time study that not only demonstrates the presence or absence of an AVM, but also shows vascular transit time. Diagnostic angiography is uniquely able to delineate the size and number of feeding arteries, and it can define the pial, dural, or mixed origin of the AVM. On CT scans, an AVM that appears as a noncalcified mass or a calcified and hyperattenuating focal mass must be distinguished from other calcified masses, such as tuberous sclerosis, colloid cysts, neoplasms, and aneurysms. 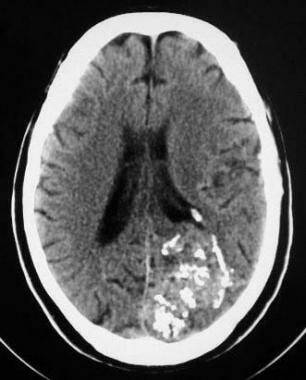 Possible causes (in addition to vascular malformation) for parenchymal hematomas seen on CT scans include trauma; coagulopathy; hypertension; other vascular pathologies, such as aneurysm, amyloid angiopathy, or vasculitis; vascular occlusion, as from a venous infarct or embolic stroke with reperfusion hemorrhage; infection; and neoplasm. Gadolinium-based contrast agents have been linked to the development of nephrogenic systemic fibrosis (NSF) or nephrogenic fibrosing dermopathy (NFD). For more information, see the eMedicine topic Nephrogenic Systemic Fibrosis. The disease has occurred in patients with moderate to end-stage renal disease after being given a gadolinium-based contrast agent to enhance MRI or MRA scans. NSF/NFD is a debilitating and sometimes fatal disease. Characteristics include red or dark patches on the skin; burning, itching, swelling, hardening, and tightening of the skin; yellow spots on the whites of the eyes; joint stiffness with trouble moving or straightening the arms, hands, legs, or feet; pain deep in the hip bones or ribs; and muscle weakness. For more information, see Medscape. Dark areas on T2-weighted MRIs can be caused by rapid blood flow, as from an AVM, aneurysm, or neoplasm; dense calcification, as from an AVM, infection, or neoplasm; or a variety of other causes not associated with vascular malformations. These include the presence of air, minerals or metals, hemorrhage, and mucinous or dense proteinaceous material. The degree of confidence is poor, since impressions on the calvarium can be seen normally. Plain films of the skull are not considered diagnostic for the detection of AVMs of the CNS. CT scanning of AVMs of the brain can show an isoattenuating-to-hyperattenuating hemispheric mass, as well as detect an accompanying abnormal vascular supply. In the absence of hemorrhage, nonenhanced CT scanning can demonstrate small foci of calcification in as many as 30% of patients (see the image below). Other possible findings include cystic cavities representing previous hemorrhage and hypoattenuation of surrounding parenchyma representing encephalomalacia, cerebral atrophy, or gliosis. The degree of confidence is moderate with CT. Typically, an additional study, such as MRI or catheter angiography, is necessary to confirm the presence of an AVM; however, this is not always needed. Contrast-enhanced CT scanning can demonstrate serpiginous vascular enhancement that is uniquely typical of an AVM. Occasionally, CT scans can demonstrate edemas, mass effect, or ischemic changes that may be associated with AVMs, and further contrast-enhanced imaging may identify small AVMs missed by plain CT examination. In the hyperacute stage of hemorrhage, a pial AVM appears as a hyperattenuating parenchymal lesion on nonenhanced CT scans because CT attenuation values and blood hemoglobin concentrations are directly proportional. Attenuation increases in the acute stage as a result of clot formation and the concomitant increase in hemoglobin concentration. The hyperattenuating region may be surrounded by a rim of hypoattenuation caused by extruded serum and edema. Because the attenuation of a hematoma decreases with time, the ruptured hemorrhagic component of an AVM evolves through a stage of isoattenuation that progresses to normal brain parenchyma. Nonenhanced lesions viewed during the isoattenuating phase may therefore appear almost normal or may shine through, appearing minimally abnormal. If intravenous contrast material is administered during this stage, vascular enhancement may be seen, as well as nonspecific or ringlike areas of enhancement. An AVM in the chronic stage of intracerebral hemorrhage appears as a hypoattenuating area relative to normal brain tissue. In general, AVM enhancement that is not contiguous with the site of hemorrhage points to an associated aneurysm or venous varix. Dural AVMs can be visualized by CT scanning. False-positive CT results may occur with lesions demonstrating enhancement or calcifications. 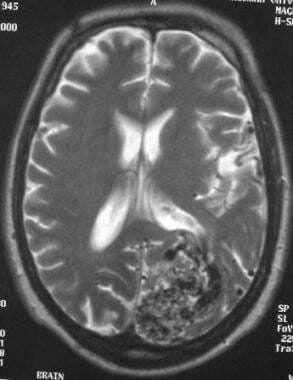 Tumor neovascularity occasionally mimics an AVM, particularly that of a neovascular glioblastoma multiforme. In addition, a wide variety of CNS abnormalities are associated with CNS calcifications, which can lead to false-positive results. False-negative results may occur if an AVM is isoattenuating relative to regional parenchyma. Some lesions may be detectable only if iodinated contrast is administered. Furthermore, an AVM may be overlooked if it is compressed by an adjacent parenchymal hemorrhage. Lastly, vascular AVMs may be misconstrued as cerebral hemorrhage because of the presence of large hyperattenuating vessels. Contrast-enhanced CT scanning or supplemental MRI or MRA can help clarify difficult cases. On MRI, a typical unruptured AVM appears as a tightly packed or loose tangle of vessels (see image below). [15, 17] The degree of confidence is high with MRI. 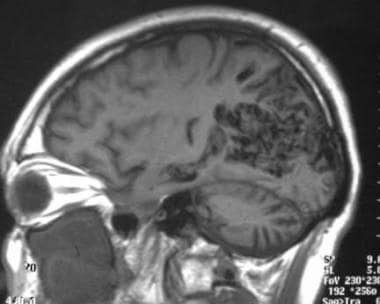 MRI scans of vascular malformations of the brain are unique and typically diagnostic of cerebral or spinal AVMs, with a high degree of confidence. MRI findings may prompt catheter angiography for confirmation and preoperative or postoperative AVM treatment. Arteriovenous malformation (AVM) of the brain. An axial T2-weighted MRI showing numerous flow voids corresponding to the CT findings (not shown). Note the mass effect on the lateral ventricle despite the lack of a mass or hemorrhage. Rapid blood flow through enlarged arteries causes a signal or flow void on routine spin-echo T1- and T2-weighted images. This finding is uniquely characteristic of AVMs. MRI scans can show the lesion size and, usually, the primary supply of the AVM and its venous drainage. MRI can further demonstrate associated aneurysms on arterial feeders as well as associated sequelae, such as mass effect, edema, or ischemic changes. Vascular steal in the brain or spinal cord adjacent to the lesion may be visualized as a region of abnormally reduced signal intensity on T1-weighted images and increased signal intensity on T2-weighted, proton density—weighted, and short-tau inversion recovery (STIR) images. MRI is particularly well-suited to document AVM rupture. The appearance of the lesion depends on the stage of the hematoma. An acute hemorrhage appears isointense on T1-weighted images and hypointense on T2-weighted images because of the presence of deoxyhemoglobin in extravasated but unlysed erythrocytes. A subacute intraparenchymal hemorrhage appears hyperintense on both T1- and T2-weighted imaging, which is consistent with the presence of methemoglobin. Chronic hematoma is characterized by a central hyperintense core surrounded by a ring of hypointensity resulting from the presence of hemosiderin deposits in macrophages in the surrounding brain. Hemosiderin is mildly hypointense on T1-weighted images and markedly hypointense on T2-weighted images. MRA is a noninvasive alternative to conventional angiography. Certain lesions hidden on conventional angiograms may be identified only on MRI scans because of their ability to depict hemosiderin deposits or other evidence of blood breakdown. Blood-breakdown products appear in a time-dependent manner after intracranial hemorrhage. MRA offers several advantages over conventional angiography. For example, because of its ability to image all vessels in a given volume nonselectively, an AVM with multiple feeding arteries can be imaged noninvasively in a single study. In addition, 2-dimensional (2D) and 3-dimensional (3D) phase-contrast MRA can be used to examine the direction, rate, and quantity of blood flow. Another advantage of MRA is the ability to retrospectively examine images in any plane. 3D time-of-flight (TOF) angiography may be used to image the fast-flow components of AVMs. Flip angles of approximately 15º and a repetition time (TR) of 40 ms are usually adequate for saturating the stationary background tissues while allowing the visualization of fully magnetized inflowing blood. Slower-flowing components of the AVM tend to be visualized poorly without the use of an MRI contrast agent because the vessels become more saturated as they course through the imaging volume. This is not entirely undesirable, as it allows an unobstructed view of the feeding arteries and nidus by effectively suppressing overlying venous structures. False-positive results may occur when other types of CNS vascular malformations are encountered; these include cavernous angiomas, venous angiomas, and capillary telangiectasias. Lesions are associated with a lower risk of rupture, but they can mimic the appearance of an AVM; however, they lack characteristic AV shunting. Nevertheless, false-positive findings may prompt catheter angiography for clarification. MRI scans can also show abnormally enlarged arteries (atriomegaly), a finding which is suggestive of an underlying malformation when none is present. False-negative MRI findings of CNS AVMs can occasionally occur as a result of a small AVM or an inconspicuous location. AVMs may be overlooked or not apparent if they are compressed by an adjacent hematoma. AVMs can also be missed if they are indistinguishable from the flow void of an adjacent normal vessel. Conventional cerebral angiography is the criterion standard for the evaluation of AVMs (see the images below). The study should include both internal carotid arteries and both vertebral arteries, with sequential evaluation of the arterial, capillary, and venous phases. External carotid arteries should be evaluated for dural contributions. The goal of the study should be to identify the number and location of feeding arteries, the angiographic location and size of the nidus, the shunt type of the lesion (eg, high flow vs low flow), and the pattern of venous drainage (eg, superficial, deep, or mixed). With angiography, the degree of confidence is high. The presence of abnormal CNS vascularity is usually best accessed by using catheter angiography, which is considered the criterion standard for AVM detection. Nevertheless, catheter angiography is a useful adjunct to cross-sectional imaging in the overall assessment of CNS AVMs, and each test provides complementary information. Arteriovenous malformation (AVM) of the brain. An anteroposterior right carotid angiogram showing left anterior cerebral artery supply secondary to vascular steal. Note that the left anterior cerebral artery does not opacify with an ipsilateral carotid injection of contrast material (see also the previous image). Arteriovenous malformation (AVM) of the brain. A lateral left vertebral angiogram demonstrating a huge left posterior cerebral artery feeder to the nidus. Arteriovenous malformation (AVM) of the brain. An anteroposterior left vertebral angiogram. Arteriovenous malformation (AVM) of the brain. The venous phase of a vertebral angiogram that demonstrates numerous superficial and deep draining veins. On conventional angiography, patent pial AVMs have enlarged cerebral or spinal arteries and veins, rapid AV shunting, and early draining veins. Dural malformations typically have slower flow or AV shunting, and they are supplied by dural vessels, such as the meningeal branches or occipital arteries of the external carotid arteries, or the meningeal branches of the internal carotid or vertebral arteries. Catheter angiography can usually be used to map all malformation feeders (pial, dural, or mixed), and it can be used to accurately access the size of the nidus. Angiographic false-positive findings are unusual but can occur in the presence of an early draining vein. This vein can be seen in a variety of disorders (most typically, in stroke). Abnormal neovascularity and abnormal venous drainage can also be seen in CNS neoplasms, particularly vascular glioblastomas and hemangioblastomas. Fleetwood IG, Steinberg GK. 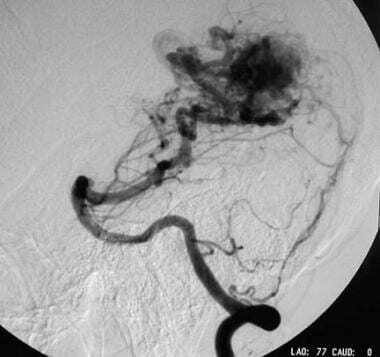 Arteriovenous malformations. Lancet. 2002 Mar 9. 359 (9309):863-73. [Medline]. Komiyama M. Pathogenesis of Brain Arteriovenous Malformations. Neurol Med Chir (Tokyo). 2016 Jun 15. 56 (6):317-25. [Medline]. Barrow DL. Intracranial Vascular Malformations. Park Ridge, Ill: American Association of Neurological Surgeons; 1990. Jafar JJ, Awad IA, Rosenwasser RH, eds. Vascular Malformations of the Central Nervous System. Philadelphia, Pa: Lippincott, Williams & Wilkins; 1999. Toole J, Murros K, Dindagur N. Cerebrovascular Disorders. 5th ed. Philadelphia, Pa: Lippincott-Raven; 1999. Yamada S, ed. Arteriovenous Malformations in Functional Areas of the Brain. Armonk, NY: Futura Publishing Company; 1999. Kase CS, Caplan LR. Intracerebral Hemorrhage. Boston, Mass: Butterworth-Heinemann; 1994. Olesen J, Welch KM, Tfelt-Hansen, eds. The Headaches. 2nd ed. Philadelphia, Pa: Lippincott, Williams & Wilkins; 2000. Tsutsumi M, Aikawa H, Kodama T, Iko M, Nii K, Matsubara S, et al. 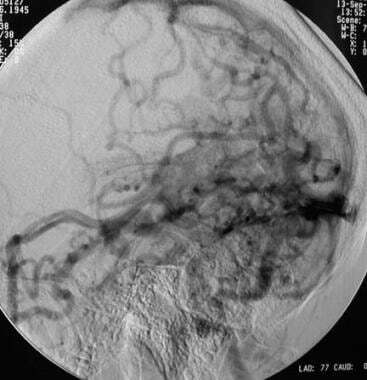 Symptomatic inferior cavernous sinus artery aneurysm associated with cerebral arteriovenous malformation. Neurol Med Chir (Tokyo). 2008 Jun. 48(6):257-8. [Medline]. Anderson CM, Edelman RR, Turski PA. Clinical Magnetic Resonance Angiography. New York, NY: Raven Press; 1993. Potchen EJ, Haacke EM, Siebert JE, Gotschalk A. Magnetic Resonance Angiography Concepts and Applications. St Louis, Mo: Mosby-Year Book; 1993. Yamashita S, Fujisawa M, Kodama K, Ishikawa M, Katagi R. Use of preoperative 3D CT/MR fusion images and intraoperative CT to detect lesions that spread onto the brain surface. Acta Neurochir Suppl. 2013. 118:239-44. [Medline]. Hadizadeh DR, von Falkenhausen M, Gieseke J, Meyer B, Urbach H, Hoogeveen R, et al. Cerebral arteriovenous malformation: Spetzler-Martin classification at subsecond-temporal-resolution four-dimensional MR angiography compared with that at DSA. Radiology. 2008 Jan. 246(1):205-13. [Medline]. Lee CC, Reardon MA, Ball BZ, Chen CJ, Yen CP, Xu Z, et al. The predictive value of magnetic resonance imaging in evaluating intracranial arteriovenous malformation obliteration after stereotactic radiosurgery. J Neurosurg. 2015 Jul. 123 (1):136-44. [Medline]. Walkden JS, Zador Z, Herwadkar A, Kamaly-Asl ID. Use of intraoperative Doppler ultrasound with neuronavigation to guide arteriovenous malformation resection: a pediatric case series. J Neurosurg Pediatr. 2015 Mar. 15 (3):291-300. [Medline]. Matsuo T, Kamada K, Izumo T, Hayashi N, Nagata I. Cyst formation after linac-based radiosurgery for arteriovenous malformation: examination of predictive factors using magnetic resonance imaging. Clin Neurol Neurosurg. 2014 Jun. 121:10-6. [Medline]. Fujima N, Osanai T, Shimizu Y, Yoshida A, Harada T, Nakayama N, et al. Utility of noncontrast-enhanced time-resolved four-dimensional MR angiography with a vessel-selective technique for intracranial arteriovenous malformations. J Magn Reson Imaging. 2016 Oct. 44 (4):834-45. [Medline]. Posse S, Ackley E, Mutihac R, Zhang T, Hummatov R, Akhtari M, et al. High-speed real-time resting-state FMRI using multi-slab echo-volumar imaging. Front Hum Neurosci. 2013 Aug 26. 7:479. [Medline]. [Full Text]. La Piana R, Bourassa-Blanchette S, Klein D, Mok K, Del Pilar Cortes Nino M, Tampieri D. Brain reorganization after endovascular treatment in a patient with a large arteriovenous malformation: the role of diagnostic and functional neuroimaging techniques. Interv Neuroradiol. 2013 Sep. 19(3):329-38. [Medline]. Connors JJ, Wojak JC. Interventional Neuroradiology. Philadelphia, Pa: WB Saunders Co; 1999. Osborn AG, Tong KA. Handbook of Neuroradiology: Brain and Skull. 2nd ed. St. Louis, Mo: Mosby-Year Book; 1996. Unsgard G, Rao V, Solheim O, Lindseth F. Clinical experience with navigated 3D ultrasound angiography (power Doppler) in microsurgical treatment of brain arteriovenous malformations. Acta Neurochir (Wien). 2016 May. 158 (5):875-83. [Medline]. Spetzler RF, Martin NA. A proposed grading system for arteriovenous malformations. J Neurosurg. 1986 Oct. 65(4):476-83. [Medline]. Kim H, Abla AA, Nelson J, McCulloch CE, Bervini D, Morgan MK, et al. Validation of the supplemented Spetzler-Martin grading system for brain arteriovenous malformations in a multicenter cohort of 1009 surgical patients. Neurosurgery. 2015 Jan. 76 (1):25-31; discussion 31-2; quiz 32-3. [Medline]. Codd PJ, Mitha AP, Ogilvy CS. A recurrent cerebral arteriovenous malformation in an adult. J Neurosurg. 2008 Sep. 109(3):486-91. [Medline]. De Biase L, Di Lisi F, Perna S, Spalloni A, Ferranti F, Lucani A, et al. Recurrent episodes of syncope in a patient with cerebral arteriovenous malformation. Clin Ter. 2007 Mar-Apr. 158(2):147-50. [Medline]. A T2-weighted coronal MRI of an arteriovenous malformation (AVM) of the brain. A sagittal T1-weighted MRI showing a small, right parietal arteriovenous malformation (AVM) with superficial venous drainage. Arteriovenous malformation (AVM) of the brain. A T2-weighted axial MRI showing flow voids. Arteriovenous malformation (AVM) of the brain. A diagnostic angiogram obtained with a carotid injection that shows the distal anterior cerebral artery (pericallosal artery) feeder, with superficial venous drainage to the superior sagittal sinus. Arteriovenous malformation (AVM) of the brain. A vertebral-injection image showing the collateral arterial supply stemming from the distal posterior cerebral artery vessels. Arteriovenous malformation (AVM) of the brain. a venous-phase image demonstrating large, superficial draining veins. Arteriovenous malformation (AVM) of the brain. An axial T2-weighted MRI that shows abnormal vascular flow voids along the left cerebellar tentorium. Arteriovenous malformation (AVM) of the brain. 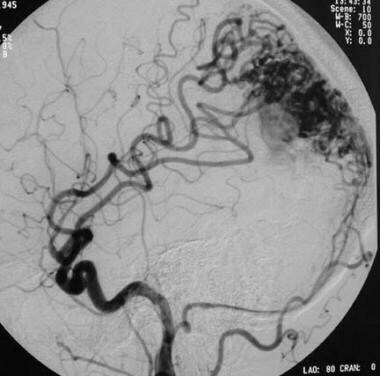 A left carotid angiogram that demonstrates feeders to the dural malformation via the posterior division of the middle meningeal artery and the occipital arteries. Arteriovenous malformation (AVM) of the brain. A left vertebral angiogram demonstrating small dural arterial feeders via posterior meningeal arteries, which arise directly from the vertebral artery. Arteriovenous malformation (AVM) of the brain. 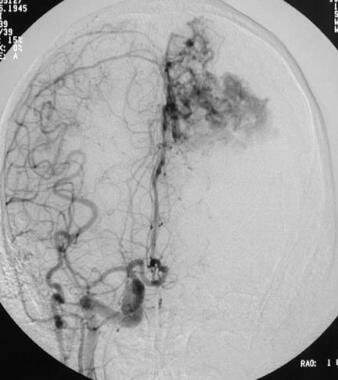 A venous-phase image demonstrating a venous aneurysm that projects inferiorly from the cerebellar tentorium; it is the presumed cause of the patient's hematoma. A lateral left carotid angiogram in a patient with seizures and an unruptured left parasagittal arteriovenous malformation (AVM). A lateral left carotid angiogram obtained after a successful staged embolization with a liquid adhesive that shows lack of arterial venous shunting.